Again, not very fancy, but certainly comfort food. Also, we got wonderful baby butter lettuce and lovely, super crunchy, super sweet Armenian cucumbers from the CSA that came together beautifully for this creamy salad. Smash the eggs and mix in the salt, pepper, garlic powder and mayo. Spread between 2 pieces of hot toast. Makes 2 sandwiches. Mix the ingredients for the dressing until smooth. Add the tomatoes and cucumber to the dressing and then pour it all over the butter lettuce. 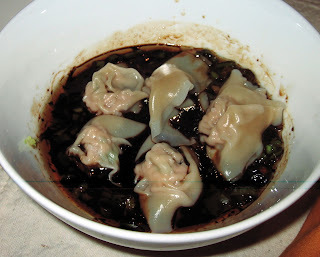 These wontons are from our friend, F.'s, awesome repertoire. Not fancy, but definitely comfort food. We made the grilled cheese in the old sandwich maker (sort of like a waffle maker, but for bread). The salad was just romaine with a homemade vinaigrette. Tasty and hearty. This dish also reheats well. Boil the rice as usual and set aside. Scramble the egg and mix into the rice. In a large, wide pan, sautee the bok choy in half the soy. Add the shrimp and sautee another couple of minutes, until shrimp are done. Add the rice and egg to this mixture along with all of the other ingredients and stir to combine. Season the steaks with steak seasoning and worcestershire sauce on both sides and set aside. Combine the ingredients for the salsa and set aside. Over medium high heat in a bit of oil and butter, cook the steak for about 5 minutes on each side, until medium rare. Mix the vinegar, oil and mustard to make a vinaigrette. Boil the cauliflower until fork tender and drain. Mix everything together. Can be served warm, cold or room temperature. One of our favorites, Zuchinni Lasagna. Mix the spices and coat the lamb chops in the spice rub. Pan fry on medium high heat for 2 minutes on all sides. Mix all ingredients thoroughly and serve.